A weeping statue is a statue which has been claimed to be shedding tears or weeping by supernatural means. Statues weeping tears of a substance which appears to be human blood, oil, and scented liquids have all been reported. Other claimed phenomena are sometimes associated with weeping statues such as miraculous healing, the formation of figures in the tear lines, and the scent of roses. Reported weeping statues are most often of the Virgin Mary and are at times accompanied by claims of Marian apparitions. However, to date only one single example of a combined weeping statue and apparition (namely Our Lady of Akita) has been approved by the Vatican and the rest have usually been dismissed as hoaxes. An unusual nature of the Our Lady of Akita apparitions was that unlike other cases the entire nation of Japan was able to view the tears of the statue of the Virgin Mary on national television. Authorities of the Catholic Church have been very careful in their approach and treatment of weeping statues, and generally set very high barriers for their acceptance. 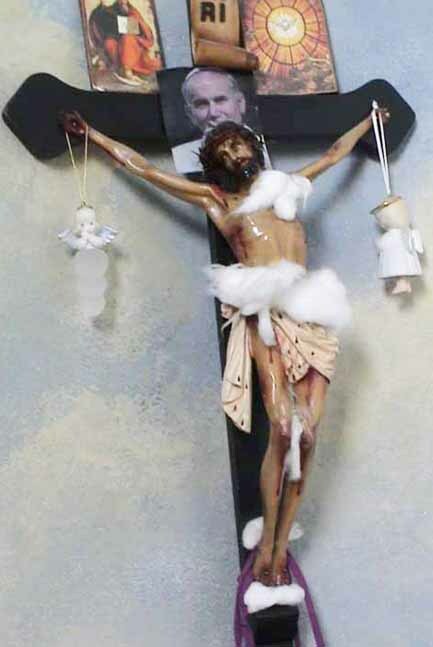 For instance when a statue of the popular Saint Padre Pio in Messina, Sicily was found to have tears of blood one day in 2002, Church officials quickly ordered tests that showed the blood was real and belonged to the statue A number of weeping statues have been declared fake by Catholic church officials. In 1995, a Madonna statue appeared to weep blood in the town of Civitavecchia in Italy. The local bishop said that he himself had seen it weep. The blood on the statue was later found to be male. The statueÕs owner, Fabio Gregori, refused to take a DNA test. After the Civitavecchia case, dozens of reputedly miraculous statues were reported. Almost all were shown to be hoaxes, where blood, red paint, or water was splashed on the faces of the statues. 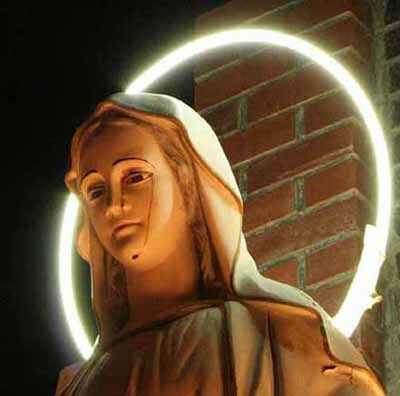 In 2008 church custodian Vincenzo Di Costanzo went on trial in northern Italy for faking blood on a statue of the Virgin Mary when his own DNA was matched to the blood. 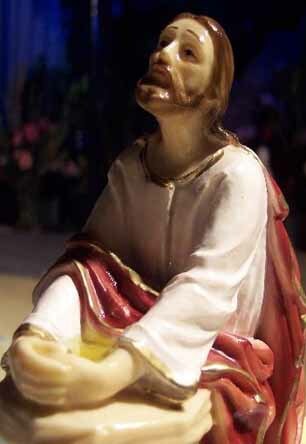 A very small number of weeping statues have been recognized by the Catholic Church, e.g. in Syracuse Sicily the 1949 shedding of tears from a statue was recognized by the Catholic bishops of Sicily on August 29, 1953. Our Lady of Akita was declared as worthy of belief by the Holy Office in 1988, and remains the only weeping statue recognized by the Holy Office. The following is a list of the more publicized claims. The veracity of these claims is difficult to establish and many have been declared hoaxes by Church officials. According to El Sol de Acapulco, the small statue began allegedly crying on January 1, 2019 - an appropriate date for such a sign on a baby Jesus statue, falling on both New Years Day and during the Christmas season. Ironically, January 1 in the Catholic Church is the feast of the Solemnity of Mary and it's usually a Virgin Mary statue that is seen allegedly weeping. This statue was and still is in a house in Kilometro 42, a rural area said to be 50 minutes from Acapulco and in such dire straits economically that itÕs no surprise residents are hoping itÕs really a miracle that will either save them or at least bring attention to their problems. 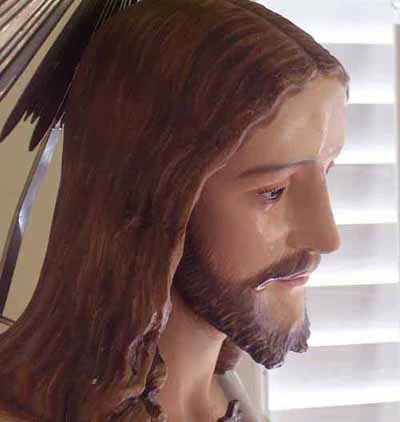 In a Catholic parish in Hobbs, New Mexico, a statue of the Virgin Mary has been "weeping." Onlookers have gathered out of curiosity, and also for prayer and healing. The liquid on the statue has been found to be olive oil and balsam - the same mixture that is used for certain Catholic rituals after being blessed by a bishop. Claims about supernatural phenomena, including weeping statues, have historically been common in Catholicism. A well-known example is the Madonna of Syracuse, Sicily, a plaster statue that has shed tears since 1953. Last year, in fact, weeping statues were reported in Hungary, Argentina and Macedonia, just to name a few. To understand why a weeping statue would be religiously meaningful, it's first important to appreciate the connection between miracles and the Virgin Mary. These statues started crying Wednesday 26, 2011 at the Rosary Center in Reading, Ohio. My mom and I went down the following Monday and saw it with our own eyes. There is nothing fake about this. I took these photos with my own camera. The statue of Jesus is only about 3 feet tall, and is simple looking. Part of the statue is a metal sun that has rhinestones in the center. There is a statue of the Virgin Mary that appears to be crying tears inside a Reading shop. In the back of the small shop is a statue of Mother Mary. It looks like she is weeping and there are two teardrops on her face. The statue of Mother Mary crying inside Our Lady Queen of Reading religious lending library is bringing tears to some visitors' eyes. There are two tear drops on her face, one rests on her chin, the other on her cheek. 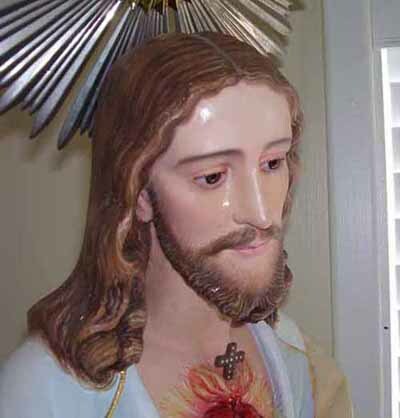 There is another statue of Jesus sitting at the top of the stairs with tears falling from its eyes. There are more visitors arriving every day as word spreads about the crying statues. Visitors who know the owner tells 9 News the owner wanted to keep it a secret for fear the statues would stop crying. Others say they believe the tears are a sign of hope. November 21, 2005 - CBS - The Catholic faithful are calling it a miracle. So they're bringing their cameras, their rosaries, their children and grandchildren to an otherwise quiet church on the outskirts of town. "To me, personally, it is a miracle. You believe it or don't believe it, that's okay. But I strongly believe it", says Sacramento resident Andre Nguyen. At the Vietnamese Catholic Martyrs Church, an outdoor statue of the Virgin Mary appears to be shedding tears of blood. Tears that stream down her face onto her robe, testing the faith of all who come. "I think that at this time in history, in terms of what's happening in the United States, what's happening in the church, that this is possibly a sign", says Sacramento Resident Brenda Harris. But fearing they were put there by pranksters, a priest here wiped the statue clean, only to have those tears return over the weekend. The church has now contacted the Catholic Diocese in hopes an investigation will be launched. Many are so convinced it's real, they weep. February 20, 2005 - AP - People praying in a grotto walked back through the shrine and noticed perfumed oil on the floor in the shrine and drops leading to the front door of the house. They went back to the shrine and I noticed that the little statue of Jesus in The Garden of Gethsemane was oozing the perfumed oil. At the same time the large Cross started to flow with the oil from the head and the wounds on the side. This phenomena has occurred on several other occasions. To this day the little statue is still moist. These events happened when the statue of The Weeping Madonna was in seclusion away from the shrine. A gentleman named Kieran, came to visit the Shrine a couple of weeks ago and asked if there is anything he could do to help. It turned out he owned a printing business, Impressions West in Northam. I asked whether he could print the message booklet. He arrived on Friday 4th March at 9pm with just over 1000 booklets in four boxes. We were just going to pray our night prayers in the grotto and asked him to join us. I asked that the boxes be carried out and placed near the icon. Three boxes were sealed and the fourth was open. We knelt and prayed the Chaplet of The Compassionate Tears of Christ and The Peace Rosary. During the prayers Our Lady appeared. Our Lady asked for the gentleman's beads and She kissed the cross on each pair of beads and thanked him. When we finished the prayers we turned on the light and each box had two or three drops of the perfumed oil on it. The box that was open had perfumed oil on the two top message booklets. Our Lady has asked that these messages go to the world and we need to get the messages to as many people as possible. February 28, 2004 AP - Photo taken in Cuenca, Ecuador by Fr. James Manjackal rHere Fr. James Manjackal meet a Missionary Carmen Patricia and saw the crucifix and the statue of the Mother of God in her room weeping, which also today still cries tears. In the photos you can see the tears flowing of both eyes. Patricia lived in the world with completely lay life change. She worked as a Model for folklore dresses. That was 16 years ago on August 29, 1988 then the Mother of God appeared to her. Fr. James Manjackal meet a Missionary Carmen Patricia and saw the crucifix and the statue of the Mother of God in her room weeping, which also today still cries tears. In the photos you can see the tears flowing of both eyes. Patricia lived in the world with completely lay life change. She worked as a Model for folklore dresses. That was 16 years ago on August 29, 1988 then the Mother of God appeared to her. Reuters - Lewis, Kansas 1996 - An egg-shaped plaster image of the Madonna, six inches high, had hung for a year in the trailer home of Thomas and Margarita Holguin in Lewis, Kansas, without incident. But in the pre-dawn hours of 12 December 1996, Margarita Holguin turned on the lights and saw what looked like tears in the eyes of the statue of Our Lady of Guadalupe. The phenomenon lasted throughout the following day, and then the tears turned blood red, the couple said. December 12, the day Mrs. Holguin first noticed the tears, is the day on which the appearance of the Guadalupe Virgin in Mexico in 1531 is commemorated. Thousands of people flocked to a remote Mexican village to receive healings from a weeping statue of the Madonna. The healing powers of the three-foot Madonna statue in San Tomas were discovered this summer by a 12-year-old girl praying for her mother who was dying of cancer. The girl discovered tears flowing down the statue's cheeks. "I thought it was the morning dew, so I touched the droplet. It tasted salty, like a real tear." 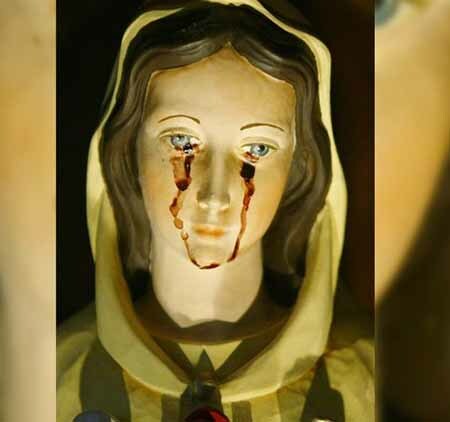 A six-inch-high porcelain statue of the Virgin Mary wept tears of blood. The liquid staining the image has been verified as human blood, Type 0 Positive. The statue wept many times, particularly when children were around. The small blue and white porcelain statue belongs to Olga Rodriguez, a housewife from the working class La Cisterna district in the south of Santiago. FOX TV special - "Signs From Gods -Science Tests Faith" - Katya Revas is a Bolivian woman who was videoed over a period of months as many miraculous things occurred in her everyday life - connected to Jesus - who she claims comes to talk to her on a regular basis. Within her home - one can witness statues and portraits crying blood or tears of oil. The blood tested as feminine. Katya takes no money - is not on an 'ego trip'. She is a woman of humble means with a spiritual heart and soul. It took her many years of spiritual work to get to the level of credibility she has attained. Scientific equipment was brought in to either verify or discredit her claims of 'talk' with Jesus. Katya allowed herself to be tested with all sorts of scientific equipment - all of which proved that she was having an unexplained experience. An EEG was strapped to her head to monitor her brain-wave patterns while she was talking to Jesus. The equipment showed her brain to be in a Delta state - sleep state - coma state - but she was awake and speaking to Jesus and those in the room with her. Katya suddenly started a conversation with a man in another room - whom she was unaware was monitoring her - or that the other room even existed as it was sound-proofed. His name is Dr. Victor Pella. He was watching her through a two-way mirror and speculating that perhaps her brain was going through a seizure of some kind - like epilepsy. Suddenly Katya started talking to him saying that she was not sick and did not have epilepsy. Everyone looked on in shock! Katya said she got the messages from Jesus who was by her side. She continued her conversation with the man - though she could not see or hear him! Katya said she was looking at Jesus. The cameras picked up a bright light reflecting off her eyes. Katya's Message, "Bring peace and love to humanity or it will be destroyed". 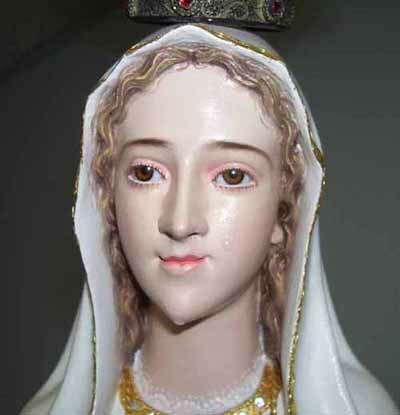 On a Sunday in June 1994, churchgoers at the Santa Rosa de Lima church in Rincon, Puerto Rico, saw tears falling from the cheek of the Virgin Mary statue. Since then, according to the priest Edgardo Acosta, tears regularly emerge from the statue's left eye and roll down her cheek to her neck. The event has created a large group of believers, and Acosta has had to rope off the area to keep people away. Church attendance has increased noticeably. Change your life. Go back to God. Find yourself. Go back to the foundation of peace and happiness which is God. This is the foundation and wellspring of love. 1995 pdate - In a back room of the Post Office in the tiny Southern Ireland village of Grangecon, County Wicklow, Post Mistress Mary Murray keeps her statue of the Virgin Mary. The painted statue stands about 12 inches high and is housed in a sealed glass case. BBC2's 40-minute TV programme Everyman of 18 December 1994 told how the statue had been found to be "crying blood". The statue, with its blood-stained cheeks, was clearly shown to BBC2 viewers. When the phenomenon was first discovered, Mary Murray was persuaded to call the local radio station and tell listeners that "a miracle was happening in Grangecon". At 3pm every day, the glass case with its holy contents is taken in procession, to the accompaniment of Hail Mary's, to be placed beside the outdoor shrine of the Madonna nearby. Pilgrims from all over the world have been to see the weeping statue, and pray. Many believe that the Madonna is using the phenomenon of tears to stimulate prayer and devotion, and small groups of believers meet regularly in Mary Murray's back room in the presence of the statue to say the Rosary and give each other spiritual support. The manufacturers of the statue say that the adhesive used to fix its eyes can become moist in certain temperatures and this could explain the happening. The Vicar of the local Catholic church is non-committal - he says he looks for God, not in statues, but in people - but he does not condemn. Mary herself has not yet agreed to have the tears chemically tested, being unwilling to open the case and disturb the statue; she would not wish it to be tampered with, as, she asserts, happened with the Turin Shroud. 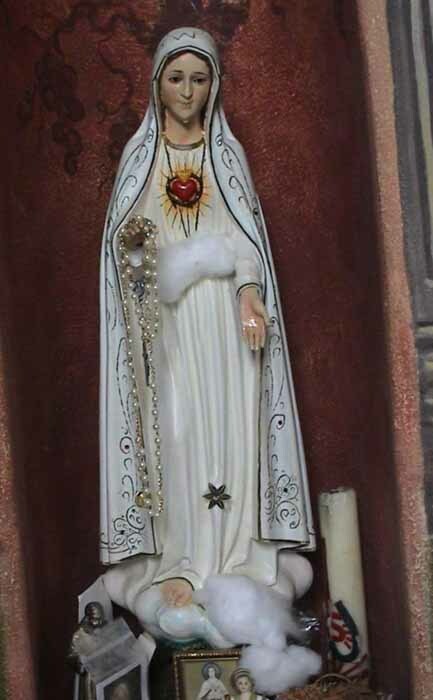 The latest in a long line of growing miracles connected with the Virgin Mary is a statue which weeps tears of blood in Civitavecchia, not far from Rome, Italy. The statue was brought back to Italy from Medjugorje for a family whose son suffered from poor health. A shrine was built for it in the family garden and the young daughter brought an offering of flowers and prayers to the Madonna daily. The child was the first to notice the Virgin's tears. The village priest was soon informed and the statue was taken away to be tested. The church is traditionally very skeptical and cautious about such miraculous events and as yet no pronouncement has been made. But the tears of blood have been analyzed by Vatican scientific experts. Their findings: the blood has been found to be human blood, from a male. DNA testing confirmed this. Other similar incidents have taken place and been reported on and investigated. The church remains silent while ordinary people continue to flock to the scenes of the miracles (although in some instances the statue or icon has been removed by church authorities for verification) to pray and offer thanks. Further sightings have taken place in Bergamo and Laziso in the north of Italy. A bas-relief of the Holy Virgin in Tivoli, east of Rome, has begun weeping. In Taranta Peligna in the Abruzzi mountains, a statue bought by a pilgrim in Lourdes has developed bloodstains on its face, throat, breasts, and hands. Since this report was compiled, a new weeping statue of the Virgin Mary has been discovered at Castrovillari, Calabria. Tears of blood from this statue were also analyzed and found to be human, belonging to the O-positive blood group. In Italy, this invitation from the Pope to pray for a miracle brings back into the public arena the claimed miracle of the Madonna in Civitavecchia, a village near Rome, where a small icon brought from Medjugorje weeps tears of blood. A theological commission appointed by the Vatican has now accepted this as a miracle, according to an unconfirmed report. The statue was first seen weeping tears of blood, which was found to be human, in early 1995. The second anniversary of this miracle was attended by about 10,000 pilgrims. The local bishop surprised those present by blessing the occasion. He said that at least two people had been miraculously cured of cancer, one in Turin and the other in Toronto. In addition, political extremists, previously dedicated to violence, had been converted to peace and Christianity. Civitavecchia is now attracting thousands of pilgrims. 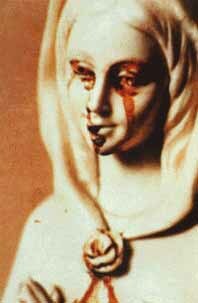 Observers have recalled the tears of blood of another statue of the Virgin Mary in Montreal, Canada, in 1985. They say this was followed by a near-epidemic of such phenomena in the case of other statues, as well as icons and crucifixes, in the city. Laboratory tests, commissioned by the Canadian Bishops Conference, found the tears to be blood mixed with fat, which melted when slightly warmed. Bishop Girolano Grillo of Civitavecchia, 45 miles north of Rome, has appealed for priests from outside his diocese to join those already on duty at the makeshift shrine of the "Madonniana", a statuette of the Virgin Mary which is believed to have wept tears of blood. He said that during recent weeks, the number of pilgrims had doubled, to more than 20,000 on some days, and was continuing to increase rapidly. He welcomed this, because he believed beyond doubt the phenomenon to be supernatural. The Virgin's blood-tears were shed for the ills and faithlessness of contemporary society, he said. The existing team of 10 priests was overwhelmed, not only by the need to distribute 2,000 hosts each at Mass, but by almost as strong a demand for confession beforehand. "They are hearing confessions in the open air, under the trees, wherever a space can be found." Most of the pilgrims are arriving in fleets of coaches from the south of the country, but growing numbers are coming from abroad. Bishop Girolano Grillo of Civitavecchia, 45 miles north of Rome, has appealed for priests from outside his diocese to join those already on duty at the makeshift shrine of the "Madonniana", a statuette of the Virgin Mary which is believed to have wept tears of blood. He said that during recent weeks, the number of pilgrims had doubled, to more than 20,000 on some days, and was continuing to increase rapidly. He welcomed this, because he believed beyond doubt the phenomenon to be supernatural. The Virgin's blood-tears were shed for the ills and faithlessness of contemporary society, he said. The existing team of 10 priests was overwhelmed, not only by the need to distribute 2,000 hosts each at Mass, but by almost as strong a demand for confession beforehand. Many of the pilgrims are arriving in fleets of coaches from the south of the country, but growing numbers are coming from abroad. Our Lady of Akita is the title of Marian apparitions reported in 1973 by Sister Agnes Katsuko Sasagawa in the remote area of Yuzawadai, near the city of Akita in Japan. The messages emphasize prayer and penance. 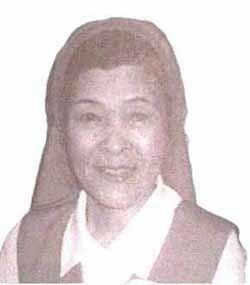 Sister Sasagawa stated that the Virgin Mary told her: "Pray very much the prayers of the Rosary. I alone am able still to save you from the calamities which approach." An unusual nature of the apparitions was that unlike other case, the entire nation of Japan was able to view the tears of the statue of the Virgin Mary on national television. For several decades, Agnes Sasagawa had encountered many health problems as a result of a poorly performed appendix operation and was immobile for over a decade. Her health reportedly improved after drinking water from Lourdes. After going totally deaf, she went to live with the nuns in the remoteness of Yuzawadai in Akita prefecture. In 1973 Sister Agnes reported apparitions of the Virgin Mary, as well as stigmata and a weeping statue of the Virgin Mary which, it is said, continued to weep over the next 6 years on 101 occasions. The nuns at Yuzawadai also reported stigmata on the statue, as well as on the hands of Sister Agnes. The stigmata on the statue is said to have appeared before the tears started, and disappeared after the tears. In June 1988 Joseph Cardinal Ratzinger (later Pope Benedict XVI) as Prefect of the Congregation for the Doctrine of the Faith, gave definitive judgement on Our Lady of Akita events and messages as reliable and worthy of belief. Sister Agnes only reported three messages from the Blessed Virgin during 1973, but the Virgin Mary Statue is reported to have continued to weep thereafter. 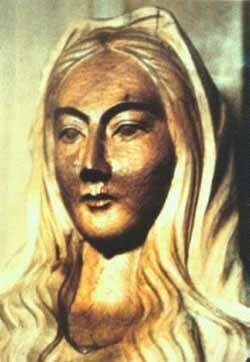 The statue of the Virgin Mary at Akita is carved from a single block of wood from a tree and is about three feet tall. Sister Agnes reported that she first heard the statue calling her, and then the first message began. "Those who place their confidence in me will be saved." During a Sunday Mass in 1982, Sister Agnes was totally cured from her deafness. Bishop John Shojiro Ito of the Roman Catholic Diocese of Niigata who had been an eyewitness to some of the events at Akita initially approved the apparition in 1984. In 1988 he went to Rome to consult with Cardinal Joseph Ratzinger (who later became Pope Benedict XVI). As the Prefect of the Congregation for the Doctrine of the Faith Cardinal Ratzinger formally approved Our Lady of Akita as supernatural and worthy of belief. According to Japanese officials, the Diocese of Sendai in northern Japan, where the Akita shrine is located, was hardest hit by the 8.9 magnitude earthquake, the strongest in the recorded history of earthquakes in Japan. As with weeping statues, the tears exuded are often said to be of a substance which appears to be similar to blood. 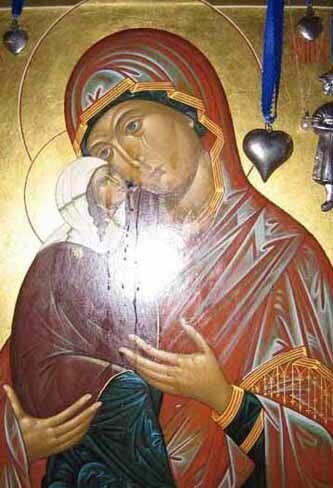 A painting of the Virgin Mary is said to have exuded moisture from the eyes and the fingers at St. Nicholas Albanian Orthodox Church in Chicago on December 6, 1986. The event gained international attention and drew many onlookers to the church. The moisture ceased in July 1987, but resumed a year later at which time 19 other icons were said to have also started weeping after being "anointed" with the painting's moisture. 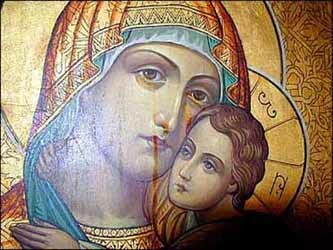 A painting of Mary on plywood was said to have wept on March 10, 1992 in Barberton, Ohio; annual pilgrimages celebrating the event were still in practice as late as 2002. Another painting of the Virgin Mary which drew many visitors to Christ of the Hills Monastery near Blanco, Texas in the 1980s was said to weep myrrh, but was uncovered as a fraud in the 2000s. A delegation from the Romanian Orthodox Church arrived at a church in the village of Musetesti, west Romania, to investigate the claims made by the two workers who claimed to have seen the Virgin Mary crying on January 2. Local parish priest Aurel Chiana said the tears had been seen for four consecutive days after that. He told local media: "It is a sign from God, but I cannot say if it's a good or bad sign." The delegation is continuing investigations into the claims and taking statements from other people who say they saw the Virgin Mary crying. The claims come just weeks after reports of tears coming from a statue of the Virgin Mary in a church in Giurgiu, southern Romania. The phenomenon of the oil drops on the icon of St. Righteous Anna has been approved for veneration. Holy Cross Antiochian Orthodox Church in Linthicum Heights, MD website mentions that their own Fr. Joachim suffered terrible pain from two ruptured disks in his spine. Even after several different medical interventions, the pain intensified to the point where Fr. Joachim became totally incapacitated. However, earlier this month, he traveled to venerate this icon. After praying before the icon and being anointed with its myrrh, Fr. Joachim was able to walk again and even served Divine Liturgy the very next day.